Buy Unique Christmas Gifts Online for Him & Her. Xmas Gifts for Oz! Unique Christmas Present & Gift Ideas. Buy Beautiful Art as Christmas Presents! A great gift idea to give to your family and friends for the holidays. Christmas is a time to be thankful for all the beautiful things on Earth and for the gifts given to us by our loved ones. It's also a time to spend with all of your family and friends, which is why buying them gifts is an age-old tradition that everyone loves. By giving your husband, your wife, your children, and your parents and grandparents unique Christmas gifts, you are telling them that you value the time, memories, and experiences you've shared with them throughout the year. One possible unique Christmas gift is a painting by a famous painter that your grandmother or wife loves dearly. If you can't think of anything different for their presents, you can give them famous art that they will surely admire. You can choose from a wide selection of famous artists such as August Macke, Van Gogh, and Henri Matisse. 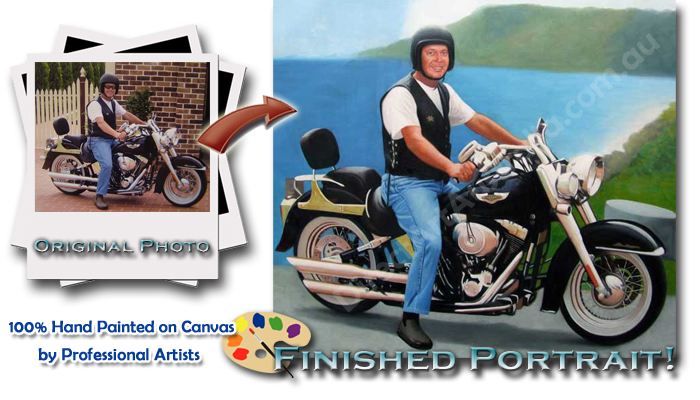 Though it will be tough to get the original artwork, you can always order a high quality reproduction hand painted by skilled artists. If you're residing in Australia and are looking for this type of art work, Direct Art Australia is your one-stop online art gallery that's got skilled painters who can do famous reproductions of classic artwork for you. Another great choice for a special gift idea for Christmas is a landscape painting on oil canvass. These paintings go well in almost any room in the home and is appreciated by a wide audience of all ages. You will definitely make your mother happy with a lovely landscape painting as a Christmas gift for her, so don't hesitate to browse through our selection of well-done landscape oil paintings, which are done with utmost care, talent, and sold at very affordable prices. Lastly, to truly rejoice in the spirit of Christmas, buy your loved ones and your closest friends original portraits from photos as x-mas presents. It's unique, special, and a memory that you can hang on your wall in a lovely frame. This can also be hung on the walls of your living room, dining room, and home office. Direct Art Australia offers all sorts of possible xmas gifts for those who love art and who enjoy art around them, so if you're running out of ideas to give to your family relatives and friends for the holidays, don't hesitate to check out our numerous art pieces on sale. Just browse through our gallery and you might just find the perfect painting to give as a Christmas present this year! Note: We offer free shipping to customers residing in Melbourne, Sydney, Brisbane, Perth, and Adelaide. In fact, we ship to customers all over Australia free of charge!